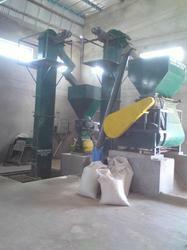 Cattle feed plant are used for prepering feed for cattles, Buffalows, Horses etc. 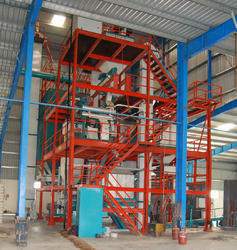 Our fabricated Cattle Feed Plant have a robust in designs and are available in all standard capacities. Our products are made up of premium grade raw material bought from a trustable vendor of the market. Equipped with state-of-art manufacturing unit and backed by a team of highly qualified technical team members, we are able to manufacture and supply a wide range of Cattle Feed plants. 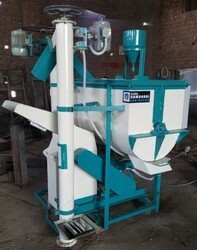 SCADA based Computerised Cattle Feed Plant are best used for their quality standards. In S8 series we use bins for storing different ingredients with the help of software programming. we call/receive an accurate quantity of material ingredients from different silo/bins to a weighting bin. This process is called auto-patching. With the help of supervisory control and data acquisition (SCADA), we monitor and control the process. We use various types of sensors, camera, read switches and decoders etc. to achieve the best possible goals. In these plants, we also have auto bagging. All ingredients enter in the plant with the full weight information and go out in bags with full weight record. Thus we have full record of all the inventory, raw material used, finish goods sold any difference or loss during process. GNE fabricated N Series Vertical Cattle Feed Pellet Plant are well known for best quality output pellet plants. 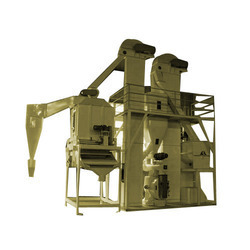 In these plants, two time vertical movement takes place on structure first is Mixing Second is pelleting, cooling and bagging all other process such as grinding will occur at ground level. The boiler is used for roasting the Feed For better digestibility. These plants one commonly used for preparing pellet for cattle, Cows, sheep’s, goats, horses etc. We design the full plants with 3-D modeling software SOLID WORKS and present in the industries for the best performance. These plants are available in following models. 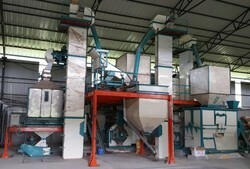 SCADA based computerized cattle feed pellet plant is best used for their quality standards. 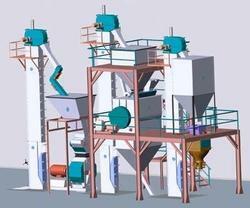 In S12-Series Computerized Cattle Feed Pellet Plants, we use Twelve silos/bins for storing different ingredients. With the help of PLC software programming we call/receive an accurate quantity of material/ingredients from different silos/bins to a weighting bin. This process is called auto batching. With the help of Supervisory Control And Data Acquisition (SCADA) we monitor and control the process we use various types of sensor, camera read stretches decoders etc. to achieve the best possible goals. 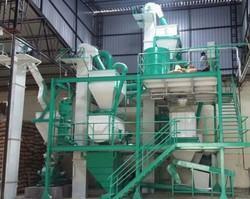 In these plants, we also have auto bagging machine. All ingredients enter in the plant with full weight reformation and go out in bags with full weight record. Thus we have the full record of all the inventory raw material used, Finish Good sold any difference or loss during the process. These plants one commonly used for preparing pellet for cattle, Cows, sheep's, goats, horses etc. We design the full plants with 3-D modeling software SOLID WORKS and present in the industries for the best performance. These plants are available in following models. Being one of the largest companies, we are now manufacturing a wide array of Semi Automatic Cattle Feed Plants all around the country. Our products are made up of premium grade raw material bought from a trustable vendor of the market. These products are quality tested as per the international standards. All these products are highly suitable for pack Pharmaceutical disposable syringe. Modular Structure: The plant is compact, occupies less floor space and has a low requirement on the mill tower, and needs low investment in civil works.